Den dobročinnosti - Bohuslav Martinů - Mediální ohlasy - ArcoDiva management - Hudební agentura - Hudební agentura ARCO DIVA Management s.r.o. 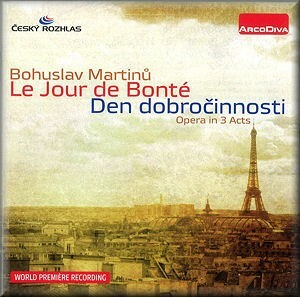 The Day of Charitywas an opera that Martinu was working on in Paris in 1931 around the time of his wedding. Its story concerns two French peasants who hear that a day of charity has been declared in Paris so they go to the capital to find needy people for whom to perform good works. However, nothing goes quite to plan: among their many adventures a beggar rejects their offering, a traffic conductor tells them off for getting in the way and a suicidal girl berates them for preventing her longed-for death. After an altercation with some women they are arrested and wake up the next morning back in their village. Perhaps the whole thing was just a dream?